Happy Star Wars Day! May the Fourth Be With You. 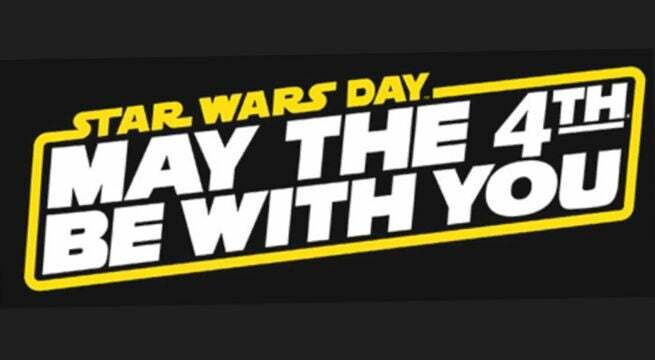 It's the unofficial - but almost official - day for Star Wars fans to celebrate their nerddom. Why? Because May the Fourth sounds a lot like "May the Force" as in the catchphrase of the Star Wars universe. May the Fourth is a wonderful example of nerds taking control of their own day. Star Wars day is just because the fans care about wordplay. It caught on so quickly that others, from Lucasfilm themselves to Gamestop and Target and all sorts of other companies have jumped on the bandwagon. Want to celebrate with your fellow Star Wars fans today on May the Fourth? Start off by putting on your favorite t-shirt, socks, leggings, tie, pin, or any other identifying piece of Star Wars material you happen to enjoy. Got it? Great. Now, there are any number of things you can do on your own. Read your favorite Star Wars comic or book, whether it’s a Legend or part of the new all-canon, like Star Wars: Bloodline, the latest novel. Try out the machete order of the films (that’s 4, 1,2,3,5,6 – with select Clone Wars episodes between 2 and 3 if you’re nasty)! Or, since Disney is now fully embracing the made-up holiday, there’s sponsored material for you to enjoy, as well, like Disney XD's day-long Star Wars Day celebration starting early this morning. So Happy Star Wars Day, and May the Fourth Be With You. This franchise that we love truly belongs to the fans in a way that many others never will; we care about it, and guide its future like none other. May the Force be with you.